LandOfCash Forex Forum » Forex Talks » General Forex Discussion » I Am Ready to Lose in Forex! Yes, you heard it right. I am ready to lose in forex trading. To put it in perspective I have to have big heart to accept losses in forex trading. I have accepted that I cannot be correct all the time with my trades. And if I have to select between risk and reward, I will select risk first. That is how much I will lose if my trade goes in not the way I would have liked. So I am ready to lose a little and want to limit my risk on every trade. I think it is first and foremost thing to know the risk on my trades beforehand. I cannot move price of any pair even by 1 pips. I simply don’t have that moving power. So what do I do? I also want to make money. So I will do what others are doing and making money. The good news is that I can see what others are doing. And I can see that on my charts in terms of technical analysis and price action. Others are also seeing the same chart and taking positions and collectively they move the price. So if I can do what others are doing, I will make money as others are making. I will trade what I see on my chart. The recent example I will give of 12-14th 2017 July AUD/USD charts. I could see AUD/USD broke above 0.7630 convincingly, which is 200 hour moving average, on 11th July(See chart 1 below). I know that after last week bullish move to 0.770, pair is consolidating and it has not crossed 200 HMA in a week. And it is only after crossing the level, I will buy the pair at 0.7640 with stop-loss 40 pips away below 100 HMA because shorter term 100 hour HMA still below 200 HMA. 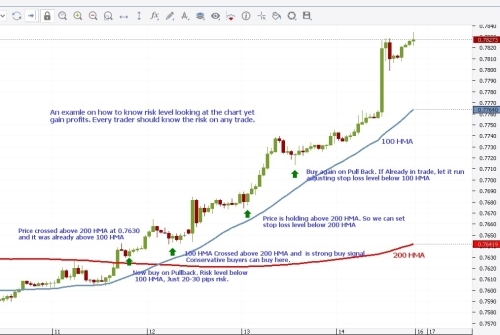 And as I mentioned others are also seeing the same chart and they will also do the same to collectively move the price. Again I see price tested 0.7710, high of previous week and it broke above resistance at 0.7720. I may will book the profit at 7710 for 70 pip gain because I am not sure if 0.7720 level will be broken. But after some time I see break of important level (0.7720) convincingly. So now I can buy at little pullback at 0.7730 or 0.7725(Labeled 1 on the chart 2 below) and continue to monitor my trade on 5 minutes chart. I will put the stop loss at 0.7705(below 200 period 5 minutes chart). And that 20-25 pips is my risk level. Now again I see Label 2, 3, 4 on the chart and price is above that level. Other traders are leaning against that level and buying at that level. I will also do what others doing. They are making money so do I. In between I will adjust my risk level as 200 periods MA is supporting the pair. And if this level gives away I will have at least some profit. Yet by Friday 14th July, I see I pocketed 80-90 pips(price broke above 0.8820) on 20 pips initial risk. As I know technical analysis does not work 100 percent. And people don’t use the technical analysis tools all the times. But they use it lot of times and that’s where they collectively move the price. I also want to be with the market so I can also make money too. I also want to use Fibonacci levels , Moving average, stochastic, trend lines etc. because others are using them too. Do I care about reward, yes off course I do. By Friday I am in profit in my second trade of about 80-90 pips. And now I can book the profit or adjust my stop loss level below 200 periods on 5 minutes chart but that level is some 30-40 pips away and I don’t want to risk my profitable position going into weekend and will close the trade. That is all about exiting the trade. Maybe next Monday 17th July on pullback to 200 periods MA, I will buy again. So I am ready to lose but I want to lose little because losing little is better than losing a lot. I know my risk and want to limit my risk. But I want to make money as others are making. Good news is that I can do this because I can see what others are seeing on the chart and I can also use them judiciously. So the first step in trading as I see that I should know what I stand to lose on any particular trade. Yet I want to increase my account balance. That is why I am doing forex trading. Can I avoid losing? No, I cannot. So I have accepted that I will be wrong at times and lose. I will define my risk level on every trade. Yet I will be risked out on many trades. So I am ready to lose a little but want to win a lot, So that my account balance keeps growing, and keep on growing. I think some people lose money by trading in very volatile pairs, however there are pairs like USDDKK where dkk to usd exchange rate 6.3326 or other pairs very profitable long term. Hey guys now no need to lose money anymore. There more methods available here for earning money so check Jeux for earning money online by playing games and by bating. Here you can win a jackpot and more prizes and you play any which suits best to you in which you can easily make money. So start earning now. I am a trader of FreshForex broker. I have been trading with the broker for more than one year and up 'til now trading with this without standing up to any issue most likely. They allow an extensive variety of trading medium and allow minimal money related experts with a broad assortment of store bonus and give the most raised help to without stopping for even a minute certainly. I have the high security of financing as they use a couple of reputed records with adept store chief. As a hawker I have in like manner high leverage, constrain trading spread with the broker and I am to a great degree content with my broker. Most Transparent Forex Broker. No deposit bonus $2018 is your probability not only to start without risk trading on honest to goodness account using the broker's advantages, yet furthermore extra and draw back got advantage! Yeah, everyone should be ready. You can win every trade you make. It's okay to lose as long as you learn from it, and that you make adjustments after and try harder to be better. Go trade and have fun. You are allowed to fail, it's okay. Don't also forget to look out for bonuses to at least lessen money that comes from your own pocket. The 101% tradable bonus by FreshForex is perfect for all beginners, and even skilled traders. Hi friends, New to this forum but have a great opportunity to you earn money online without investment. You need to come across this website this is the platform where you not only earn also you can enjoy your time here. They accept bitcoins and all other cryptocurrencies. surely in forex trading this must anticipate the risk of not falling prey to losses. 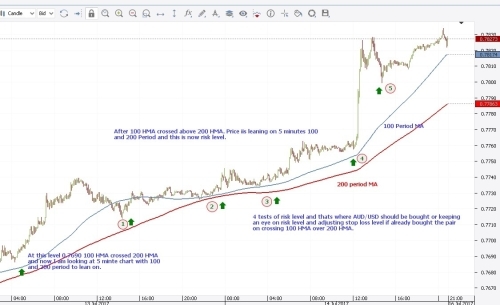 by continuing to train with other brokers, practice skills and analysis, Broker who have large spreads like Grandcapital that I have tried and finally are not comfortable with. Why not to try dice betting games and don`t waste money on Forex? Yes I know that forex is a really big service with a good database of users, but without any experience and special courses it will be really hard for you to earn something. I don`t know, I better prefer to earn money playing various games like dice one. And I recommend you to start from such game too. evaluations that we do on a regular basis will be quite helpful for us to be better at managing the funds we have on trading opportunities, including regarding our emotional control when conducting trading activities. regarding emotional control it is very important that we master it in FreshForex too , so that the course of trading can be more directed and controlled.